Below are beaded headstalls for sale on Amazon, eBay, and Etsy. They're available alone (just the headstall) or in matching headstall-and-breast collar sets. Amazon and Bay usually offer beaded headstalls that are ready to ship, while the ones on Etsy can often be custom made. You might also like: Beaded Horse Halters. Below are beaded headstalls for sale on Etsy.com. Most of the headstalls we have seen on Etsy are custom and made-to-order (usually with your choice of colors, design, etc. ), but you can also sometimes find already beaded, ready-to-ship headstalls. Knowing exactly what you are, and are not, getting is key to a happy transaction with an Etsy seller. Please scroll down for more good things to know before buying a beaded headstall on Etsy. Below is a random selection of Etsy sellers we have found offering beaded headstalls. Or, click here to see see all the beaded headstalls on Etsy. Remember, most of the beaded headstalls shown below were made in the past for someone else so the headstall shown will not be available. However, the photo still serves as a good example as to what that Esty seller can create. At the DeesBeadedDogCollars Etsy shop they bead a lot more than just dog collars. Based in Tremonton, Utah, DeesBeadedDogCollars also makes beautiful, custom beaded headstalls. 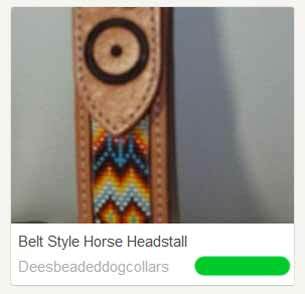 Click here to visit the DeesBeadedDogCollars Etsy shop or click the image below. 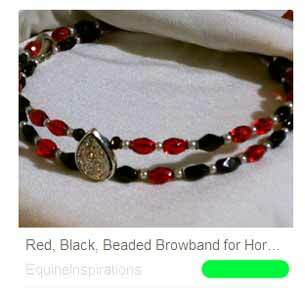 The Equine Inspirations Etsy shop has beautiful beaded browbands for headstalls. They make all different colors and styles; only a small representation is shown below. 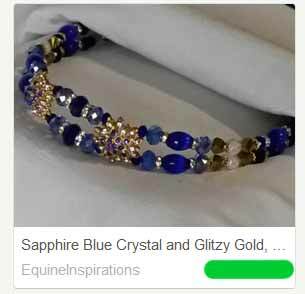 To see everything they make we suggest you visit the Equine Inspirations Etsy shop or click the images below to look at that particular style and colors. Equine Inspirations is located in Syracuse, New York. What, exactly, is the seller calling a beaded headstall? Is it only, or mostly, just beads, or is it a leather or nylon headstall with beadwork added? Is it the whole headstall, or just part of it? Many sellers make the entire headstall while others make only part of the headstall (for example, a beaded browband). If the seller is selling the entire headstall (and not, for example, just the browband) do you supply the headstall or does the seller? Some of the Etsy sellers we have seen have you send your headstall to them for beaded customizing, while others supply the headstall themselves. Read the description to find out who supplies the headstall. Are returns accepted, or refunds given? (When reading an item's description click the "Shipping & Policies" tab for this information.) On customized items, many sellers do NOT offer returns or refunds. However, each seller is different and sets their own policies. If you don't see the information be sure to ask the seller what their policies are before placing an order. Does the seller have good feedback from previous buyers who have purchased from them? lBy the way, if the seller has very little feedback that may not be a cause for concern. While there all types of sellers on Etsy, including businesses that do a large volume of selling, many of the sellers are individual craftsmen or small businesses specializing in handcrafted items. This means these sellers don't deal in high volume - by their own choice - and therefore only have a small amount of feedback. Just make sure any feedback they do have is positive. Last but not least, if you have any questions about a beaded headstall be sure to ask the seller before you buy! Look for the "Ask a Question" button on the right-hand side of an item's description, to the right of the photo(s). ).